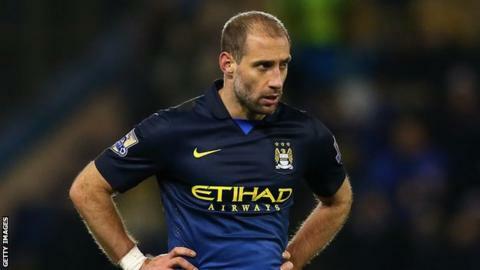 Manchester City right-back Pablo Zabaleta faces up to a month out with a knee injury suffered in training. The 30-year-old Argentine was an unused substitute in City's opening two Premier League games following his involvement in the Copa America. He could miss up to six games, with Bacary Sagna likely to continue to fill the right-back spot. "Pablo Zabaleta has a problem in his knee, with the ligament," manager Manuel Pellegrini confirmed. Zabaleta told the club website: "It's the first time in 12 years of senior football that I've ever been injured like this so it's a blow, especially at the start of the season." Left-back Gael Clichy and midfielder Fabian Delph returned to training this week, although it is not known if they will be considered for Sunday's Premier League game at Everton.